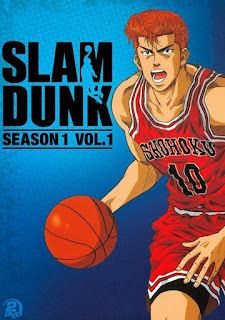 Howlin' Wolf Records: SIX STRINGS: Cinedigm: SLAM DUNK: SEASON 1, VOLUME 1 on DVD! “SLAM DUNK: SEASON 1, VOLUME 1” Produced by Toei Animation, the same studio responsible for megahits like Digimon, Dragon Ball Z and Sailor Moon, SLAM DUNK is based on the hugely popular manga/comic series and has a substantial existing fanbase. Volume 1 features the first 14 episodes of the first season! 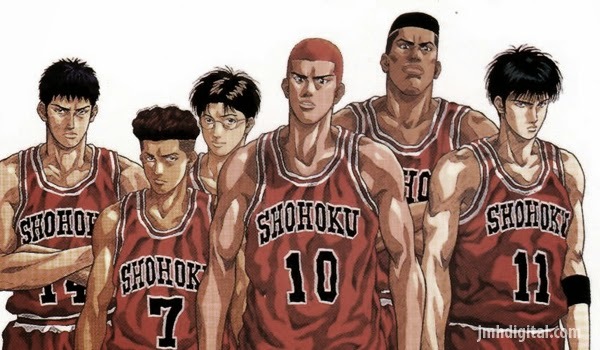 Hanamichi Sakuragi is a high school punk who hates basketball, mostly because the girls he likes always prefer basketball players to him. Things change, however, when he meets the cute and available Haruko Akagi. She loves basketball and thinks Hanamichi has the height and prowess to play. Hanamichi, quite willing to settle for collateral affection, immediately takes up the sport, never mind the fact that he doesn’t know the rules, cannot dribble and is constitutionally unsuited to teamwork and sportsmanship. If playing basketball will get Haruko to look at him then he’ll be a basketball star! However, a weird thing happens to Hanamichi while struggling to make the team and play the game: he kind of starts to like it! And what’s more, he’s getting good. This is a great idea for a Japanese show and foghts against the stereotypes of Power Rangers.